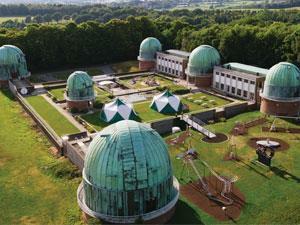 Enjoy hands-on science and discovery among the domes and telescopes of a former world famous observatory. With over 100 interactive science exhibits, as well as Telescope Tours, Open Evenings to view the night sky, Astronomy Courses and many Special Events throughout the year, our aim is to make science spectacular and fun for everyone. The Observatory Science Centre reserves the right to alter admission charges without prior notice. As an historic site, accessibility is very limited, especially where the telescope domes are concerned. It is provided wherever possible. In the cafe as much help as possible is given with dietary requirements. There is a special entrance with a ramp for the disabled as the main entrance is difficult.